keywords: mtfIFPath=/assets/vendor/doubleclick/, origin=gizmodo, visited=gizmodofront, visited=jalopnikfront, visited=lifehackerfront, visited=gawkerfront, viewed=dealzmodo Amazon’s long-rumoured video streaming service has finally arrived. But what is it, exactly? You know the drill by now, right? You see something you want to watch, you click on it, it streams directly to your PC or set-top box or TV. Amazon’s got over 5,000 (commercial-free) movies and TV shows out of the gate, and while streaming was generally smooth there doesn’t seem to be a great number of HD titles being offered up for free. And maybe I’m just spoiled, but the SD titles don’t look so hot. They do have The Human Centipede, though, since you were wondering. This might be the most enticing part of Amazon’s video proposition: if you’re already shelling out $79/year for the free two-day shipping Amazon Prime gets you, then Instant Video is just an added bonus. If you’re not already a Prime member, $79/year works out to about $6.50/month—cheaper than the least expensive plans offered by Netflix and Hulu. And if you’re unsure whether you want to commit to Prime, you can sign up for a one-month free trial here. Quick caveat: Student Prime memberships aren’t included; to get Instant Video you’ll have to upgrade your account. Which, kinda lame, right? Amazon’s lined up what looks like a decent array of hardware partners: GoogleTV, Logitech, Roku, Panasonic, Samsung, Sony, Vizio. But then you see who’s missing: Xbox 360, PlayStation 3, Apple TV. TiVo is listed as a partner, but the fine print says not yet. Those are big names absent from the party, especially since they’re the ones you’re most likely to own already. Want to watch the original The Girl Who Kicked The Hornet’s Nest with subtitles? Go for it! Prefer dubbing? That’s OK too! Nice option to include, although it doesn’t appear to be there for every foreign language flick.More important is that Amazon Instant Video also includes the option to rent or buy the free videos as well, if you want to take them on the go when you don’t have a reliable internet connection. Average price seems to be $12 to buy and $4 to rent (for 3 days) a new or newish movie release, and $10/$3 for the back catalogue stuff. You poke around Amazon Instant Video the same way you poke around Amazon. Which is to say, it’s an endless sprawl, a mishmash of content with limitless drilldown options. That’s good when you’re just diddling around on the site with disposable ducats to burn, but finding something to fit your movie mood isn’t a exactly intuitive. Amazon also takes the opportunity to plug its paid streaming service, so don’t get too excited when you see The Social Network listed in the Instant Video section, only to discover that it’s strictly pay per view. While there are interesting movies here—Man on Wire, Helvetica, Let the Right One In—Amazon’s missing the content that will draw in either the cinephiles (like Hulu’s mega Criterion partnership) or new release junkies (an itch that Netflix’s longtime Starz deal manages to scratch). I’m sure Amazon’s going to beef up its selections. But they’d better do it fast. …so don’t go out of your way to sign up. If you’re an existing Prime customer who owns a Roku, you just got maybe the sweetest added value feature ever. 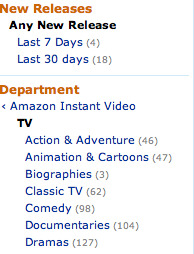 But for the rest of us, Amazon Instant Video seems like a faded carbon copy of services to which we already subscribe.